This is a guest post written by Ruth Taylor. The image shows Ruth at a recent gap year conference (left). I’ve been working to transform the international volunteering industry for close to ten years now. 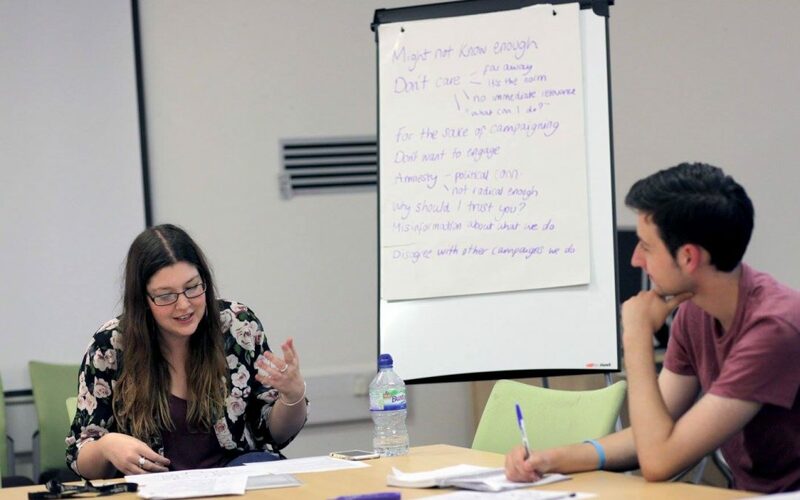 In that time, there has been a steady rise in public criticism of the way volunteer programmes are designed and run – and sometimes even that they’re run at all! We’ve seen what feels like hundreds of Guardian articles questioning whether Western volunteers do more harm than good. Universities across the UK have pledged to no longer advertise volunteer placements in orphanages to their students. Even one of the world’s favourite authors, J K Rowling, has publicly waded in on the debate. In many cases, young people are educating themselves and making wise decisions when it comes to deciding if, and how, they want to volunteer abroad. However, the volunteer travel industry continues to grow, with the latest figures suggesting that as many as 10 million volunteers go abroad each year, leading to a comfortable turnover of roughly $2 billion! And in fact, given the worryingly unregulated nature of the industry, the actual number is probably far higher. Whatever the exact figure, it’s safe to say that people’s good intentions and desire to see the world are successfully lining a few pockets. Over the past few years, I’ve spent a decent amount of time talking with volunteer travel providers on the harms that international volunteering can do. On the whole – and I’m just going to say it – I’ve found them to be a lovely, friendly bunch of people. As an international development practitioner, who at times has felt extremely frustrated by the reality of overseas volunteering, I would find the whole situation far easier if I could just hate the whole lot of them! If I could just tarnish all of them as stupid, uncaring, poverty-exploiters, I could continue to sit aloft my chair of impact superiority, quietly judging their lack of ethics and blaming the continuation of global inequality on their actions. But… it’s funny. It’s far harder to hate somebody when you’ve met them and they’re actually quite nice. In my experience, individuals working within gap year travel are not too dissimilar to folks who fill the offices of international development organisations. They’re wanting to do something more with their life, to spend their working hours doing something with purpose. Ultimately, they work in their industry because they believe it is a way of making the world better. Over the last few years, I’ve witnessed volunteer travel professionals earnestly sharing ways to try and foster increased global citizenship amongst the young people on their programmes. They discuss how to provide volunteers with experiences that make them kinder, more humble and committed to community, mutual respect and understanding. You can see that they truly believe that they are doing their bit to raise a more socially-conscious generation. In volunteer travel conferences where I’ve been a fly on the wall, I’ve never heard any mention of the local communities who receive these volunteers. As an educator of young people myself, I too invest many of my working hours in trying to suss out how to best design learning experiences that allow young people to understand the world they live in and their role in helping make it a more just, equal and sustainable place. What I’m trying to do and what my peers across the volunteer travel industry are trying to do isn’t all that different. What is different, is our approach and our understanding of how change happens on the level needed to truly transform the world. Within the travel industry, the product or service is designed with the buyer in mind. The aim of the game is to give them a fantastic experience, so that they buy again or recommend to a friend. Volunteer travel companies – like nearly all other businesses – have to operate within these parameters if they want to survive and remain profitable for their shareholders. Within the development sector on the other hand, the local community is central. The programme is designed alongside them and they determine what success looks like. In volunteer travel conferences where I’ve been a fly on the wall, I’ve never heard any mention of the local communities who receive these volunteers. There aren’t sessions on forming and maintaining local partnerships, on respecting local culture or building sustainability. I rejoice in the commitment to support the development of more caring young people, but I can’t help but feel that local communities are somehow regarded as simply the setting in which this personal transformation takes place. Similar to outdoor education programmes, that use nature as their setting to help create well-rounded, confident young people, international volunteering ‘uses’ a local community in order to achieve its intended outcomes. This, for me, is extremely concerning and the crux of the issue when it comes to improving the work of the international volunteering industry – we’re in a tug-o-war between the ‘travel’ and ‘volunteer’ aspects of an international volunteering experience. In development, we firmly believe that communities are not playgrounds for the good intentions and egos of Westerners – no matter how well intentioned they are and regardless of the way it might help them develop into an individual dedicated to justice and equality. Communities are never a means to an end. But, we must remember that it has taken us a long time – too long – to learn these lessons and in many cases, the white saviour complex is still alive and kicking across much of the sector. What development has learnt, many gap year companies still need to. And yes – it is completely down to white privilege, an alarming lack of understanding of the root causes of inequality and how to tackle these that allow them to continue with their work without knowing this stuff. But, if we’re honest, how many development agencies can we say are completely full of people who think differently to this? How many of us can claim we work in organisations where other priorities – be they funding related or otherwise – never crowd out what is morally or ethically the right thing to do? The only way we can hope to transform overseas volunteering practice for the better is to convene space for open dialogue. Now, I haven’t met every staff member within the gap year world, nor have I met many of the shareholders profiting financially from business as usual, so maybe there are some genuinely bad apples knocking about in the barrel. But, on the whole, when speaking face-to-face with providers, I’ve found a desire to know how to do this better. Good intentions are never enough to justify unethical practice, but neither can you know what you don’t know. It’s so important for us to ask how the disconnect between intentions and impact has gone unchallenged for so long and begin the conversation to place local communities at the centre. What development has learnt, many gap year companies still need to. And yes – it is completely down to white privilege. Let’s sit down with gap year providers, make space for local partners at the table, stop yelling and finger-pointing at each other and actually do the difficult work needed to tackle the damaging foundations which sustain unethical international volunteering. If done properly, we may be able to build something back up which matches the good intentions of millions of people worldwide, with the approaches needed to actually bring about real change. Ruth is currently Senior Campaigns and Mobilisation Manager at Restless Development where she supports young people to lead change in their communities. A member of the ReThink Orphanages coalition, she has been working to transform the international volunteering sector for the past 10 years and is currently supporting The Love You Give campaign. Connect with Ruth on twitter at @Ruth_STaylor.